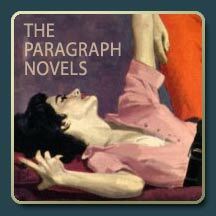 now you can get up to 5% more pleasure from the paragraph novels simply by clicking on the novel titles. 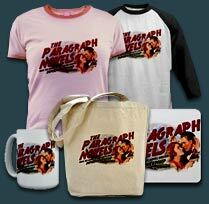 because here at the paragraph novels, we know what you want, and we know how to give it to you. *author's note: canadians may experience only 4% more pleasure. I like it... a lot. I'd say that you should take some time for yourself though... you know, catch a movie, walk the dog, say hi to the wife and kids, but I won't say that. I need more writing and art, now. Came by to collect my extra 5% pleasure. I note you were careful to offer only up to 5%. I only registered 3.9% at first but vigorous rubbing is now slowly nudging the needle up. By the way your request for cash has been passed to my bankers. I imagine they will consider you sympathetically but don't wait up! Blast, I promised I would stop using exclamation marks. Oh-my-gawd, you people are great! This is fantabulous! Thank you for your recent kind comment and the honour of a link. You might notice I have already taken the liberty of adding a link to you at the 'Buick City Complex'. I trust that's ok with you. 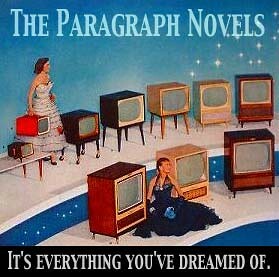 Your stories have me laughing like a drain and that's pretty unusual I can tell you. Very glad to have made your virtual acquaintance. mere existence, a comrade in arms, i thank you. perfect virgo, i raise my glass to you sir. A great idea for a blog. Though some of us might like this great idea and start stealing it for ourselves. very thing in your blog is perfect! jeez, invision me naked already! Maybe I'm misusing your site because I'm getting *whispers* 10% more pleasure. But really, that's no problem at all.